Every once in a while, we here at Android Headlines get the pleasure of covering phones aimed at a more opulent crowd. Normally these phones come from the likes of Vertu, though lately Lamborghini has entered the fray. Today, however, the phone in question comes from a more mainstream manufacturer: HTC. 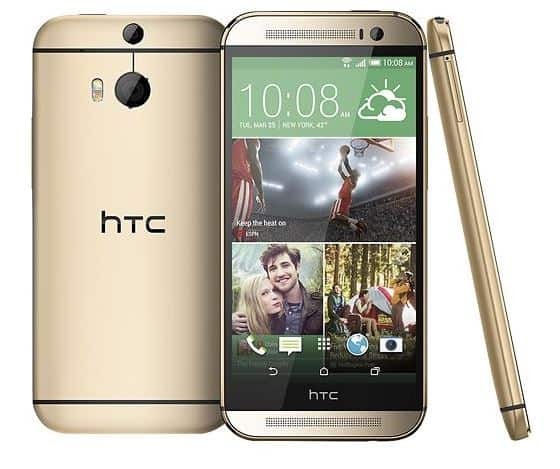 The company is launching a gold-plated variant of the new HTC One (M8) in the Middle East on Friday, April 4, with the device will selling for SAR 2,800 in Saudi Arabia and Dhs 2,750 in the United Arab Emirates. The One (M8)’s Saudi Arabian price equates to around $750 US, so consumers will be paying a little more for the gold-plated edition of the phone. Other than the aesthetic changes, the phone’s specifications appear to be staying the same, so not much will change in the jump to the Middle East. Still, the gold-plated version costs a little more than an off-contract One (M8) goes for here in the States, so it is commanding a bit of a premium price. That isn’t all though, as HTC also announced plans to launch a “real gold” version of device in the region. The phone should be launching at the end of April or early next month, and while no official price was given (it never is), HTC EMEA President Phil Blair told Gulf Business “It will be very expensive.” If you ever thought it would be a good idea to carry around a phone made of gold, we suppose now is your chance. Interestingly enough, it sounds like this gold edition will be hitting other regions of the world, as Blair said the Middle East would have exclusivity for at least a few weeks after launch. That suggests it will be launching in other territories before long, so maybe more people around the world will get the opportunity to spend a ton of money on a blinged out version of the M8. Will this premium edition of the M8 end up reaching Vertu phone prices? That remains to be seen, but if it actually features real gold, we wouldn’t be surprised. Keep it here and Android Headlines for more. The post HTC One (M8) Gold-Plated Version Launching Today, ‘Real Gold’ Edition to Follow appeared first on AndroidHeadlines.com |.